October 10th, 1990 started like any other day for mushroom hunters who were searching for seasonal goodies in the town of Brockway; within Jackson County Wisconsin. They were adjacent to an industrial park that is just off of Interstate-94, on Bauer and Airport road, near Black River Falls. As the hunters walked carefully around, they noticed a plastic bag protruding from a shallow grave. The bag contained the remains of a torso that had been unearthed by animals. The hunters immediately alerted authorities who quickly responded. Once they had arrived on the scene, Authorities discovered a second plastic bag containing the victim’s limbs. The second plastic bag had also been buried in a shallow grave. Jane Doe’s skull was never recovered. It is believed whoever was responsible for this monstrosity was in a hurry and therefore did not have the time to dig deeper graves. Location of Julia Baez’s discovery. The remains were sent to Steve Schreiber, the county’s coroner in 1990. Without a skull, Law-enforcement couldn’t generate a forensic reconstruction of the victim. In other words, they were unable to provide a sketch to the public to aid in Jane Doe’s identification. There was little information to go on and with no matching missing person’s reports, they had no choice but to bury the remains with the hopes of DNA technology someday advancing. Schreiber took a personal interest in this case and assisted in planning the funeral. He was 1 of 6 that attended the ceremony. He also kindly tended the grave for the next almost quarter of a century, often bringing flowers, believing if he didn’t Jane Doe would be forgotten. In 2014, the Center for Human Identification at the University of North Texas issued a grant that provided Law Enforcement in the area with additional resources. They chose to use some of the resources to exhume Jane Doe in the hopes of obtaining a DNA profile from a piece of bone. Jane Doe was exhumed on July 7, 2014. It wasn’t long before a full DNA profile was obtained from a mere fragment – technology that wasn’t even fathomed in the early nineties! The DNA profile was then entered into a national database. It came back with a match! 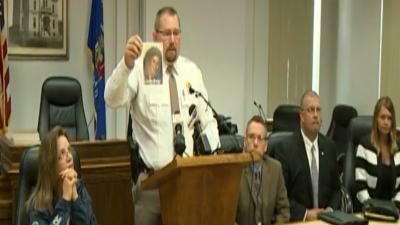 Jane Doe was identified as Julia Baez, a 36-year-old mother of 4 who had been missing from Milwaukee since June 1990. Press Conference where Julia Baez was identified. When Julia’s two daughters were older, they went to Law Enforcement for help. However, with only a story and no actual paperwork to prove their mother had even existed, they were turned away. Eventually one daughter found her Mom’s (Julia Baez’s) birth certificate and the sisters returned to Authorities. This time they were taken seriously and asked to provide a DNA sample for comparison. The sisters didn’t have to wait much longer for an answer as while they were providing their DNA sample, coincidently Jane Doe was being exhumed for advanced DNA testing simultaneously. Once the profiles were both entered into the national database a match was made! Steve Schreiber, the county’s coroner in 1990, now the Fire Chief of Black River Falls, had tended to Jane Doe’s grave for almost 25 years. Now that she had been identified, he was able to personally return the ashes of Julia Baez to her daughters in Milwaukee. The sisters, understandably upset by the way their mother was found, hope justice can be carried out. They are ultimately happy their mother has a proper resting place under the correct name. As this is an ongoing homicide investigation, Law Enforcement hasn’t released much information. They have stated with a name, they can now interview those who were last in contact with Julia Baez before she went missing and retrace her last steps. They are hopeful, with this new information, they can find the person(s) responsible and bring them to justice. The Jackson County John Doe: was discovered on August 15, 1978 near the village of Warrens. Authorities recovered the victim’s skull, lower mandible, and a few vertebrata. The Vernon County Jane Doe: was discovered on May 4, 1984 near the town of Westby. Her hands had been severed at the wrists. Rhys Marie Pocan: little information can be found on her other than she was discovered September 2, 1989 in the town of Lyndon in Sheboygan County. She was decapitated and missing her hands. Her skull was never recovered. Rhys Marie Pocan’s severed hands were discovered in Vernon Marsh in Waukesha County in October 1990. Julia Baez: who was last seen in June 1990 and discovered on October 10, 1990. Her skull was missing and it was never recovered. The St. Croix Jane Doe: was discovered on October 19, 2002 in Holton. Only her skull and lower mandible were recovered. When the skull was initially discovered it was believed it must belong to either Julia Baez or Rhys Marie Pocan, it however is a separate victim altogether. It is unclear if any or all of the cases are related. Law Enforcement agencies from five counties have met to discuss the possibility of the cases being connected. No leads turned up from this discussion but it is comforting to know, gone are the days where Law Enforcement agencies in different jurisdictions kept their information secret. Sharing information and being open to different possibilities shows a desire for justice for these individuals no matter how much time goes by. It is worth mentioning that the hands belonging to Rhys Marie Pocan and the hands belonging to Doris Mcleod were discovered within 10 miles of each other. It is also notable that Julia Baez and Rhys Marie Pocan were both 36 when they vanished from Milwaukee and lived within walking distance from each other. Julia Baez was also discovered near Black River Falls where Rhys Marie Pocan grew up. IF YOU HAVE ANY INFORMATION REGARDING THIS CASE, PLEASE CONTACT THE JACKSON COUNTY SHERIFF’S DEPARTMENT AT 715-284-5357 AND ASK TO SPEEK WITH A DETECTIVE.